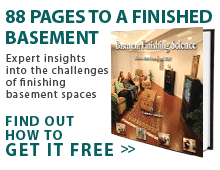 Total Basement Finishing (TBF) represents a better value in basement finishing. We include more features on our systems to enhance the personality of your home. With energy savings in mind, the TBF system is a "green" choice, as well as highly moisture, water and mold resistant! There are many features in our finishing systems that are integral in keeping your basement healthy while saving you money on your energy bills. For a FREE ESTIMATE from your local authorized TBF dealer, complete the form to the right.